I cannot help but wander some days through the glamour of Tuktura’mei. The jewel of Ra Kotu, for all my resentment of having finally found permanent housing in the city with Arjana still manages to dissuade me from my prejudices of a city. I will admit, that I am biased in many ways in saying this. I am privileged here, if I were anyone else I would imagine I would have fallen to fine silks and finer wines long ago. The money that trades hands and the interesting character the city takes as a port and trading hub of the province never ceases to impress and tempt me to a degree. Yet, above all else the unique nature of the city is also what keeps me bound to my origin as much as it separates me from it. When I arose from my bed this morning, parting ways with my Lioness with a kiss and dressing myself in leathers that have seen use in the wastes of the Alik’r for many years I will admit feeling somewhat lethargic. My scars tingled and nipped at me, my throat was dry, and could not help but feel some form of desire to embrace the Desert’s Rage for a brief moment to numb such minor annoyances. I am not an old man, why would my body betray me like this? My joints do not ache, I can fight from a saddle just fine, and I could wrestle a stallion down to its knees. But, I bear the weight of a thousand souls and its weighs heavy. I find my comforts when not in the arms of a lover or in the adrenaline of a fight in other means. I tend to avoid the main streets in Tuktura’mei, the place between the Grand Bazaar and the Temple are too much for me at times. 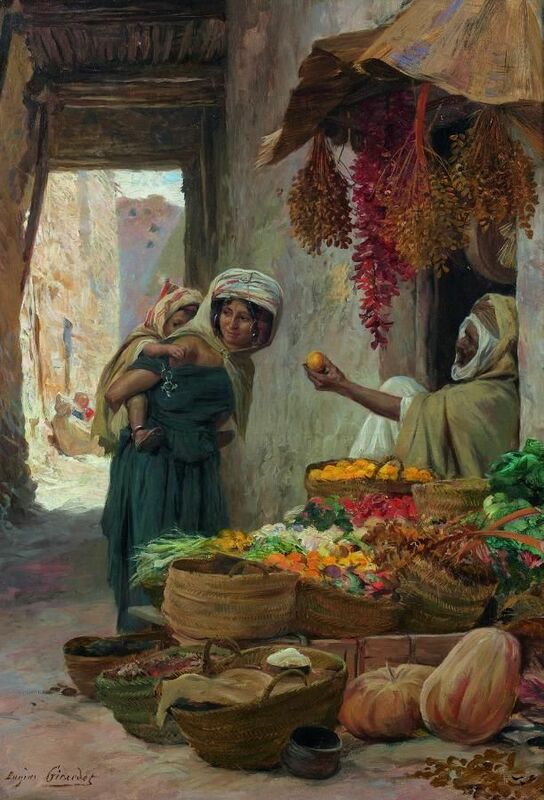 The bustle of the crowds and merchants haggling their wares, visiting foreigners enjoying the spectacle of entertainers and the wealth of these lands as they buy trinkets from clever men of the sands. Others come with black hearts and are lured by the shadow the estate casts over the habor, illicit goods and deals to twist the harm they could do to favor the Alik’r. While it has left a bad taste in my mouth in the past, I cannot deny that controlling the crime is much easier that eradicating it, nor can I deny my own sin in maintaining this balance; I pray sometimes for Ruptga to forgive me, but I know that actions speak louder than words. As long as we do good to these people, I do not feel the weight of these sins. The alleyways between buildings and neglected streets where many of the natives of the city and of the Alik’r itself are far more familiar grounds for me. I smile beneath my mask as a orange merchant offers a taste of his wares for free to a young mother and child. The child is shy of this strange old man, but she ultimately accepts the gift and her mother makes sure she thanks the man properly with a “thank you” that rolls out in broken Yoku. It brings a smile to the merchant’s face and to mine as I pass. It is small scenes like these that endear me to these places less traveled, scenes that are preserved as crime is regulated behind closed doors; for the most part these streets are safe at night and day. I walk further down the street, the worn sandstone under my boots scraped slightly by my spurs. It often betrays my presence, but the khopesh at my side and the red sash around my waist are signs enough that I am the Huntmaster. I do not need to show my face to these people for them to know who I am, I sometimes receive welcome smiles and wary glances. 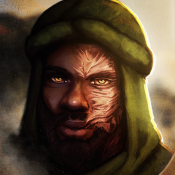 Most in these neighborhood are Redguard, many seem traditional and despite the nature of my job; the modesty I take in hiding my face absolves me of some of the dirtiness that comes with it. I pass another man preparing a morning coffee for his family in a large metal pot. I have grown to know this man as Ibrahim and he offers a steel cup to me as he waves me down with a wide grin. 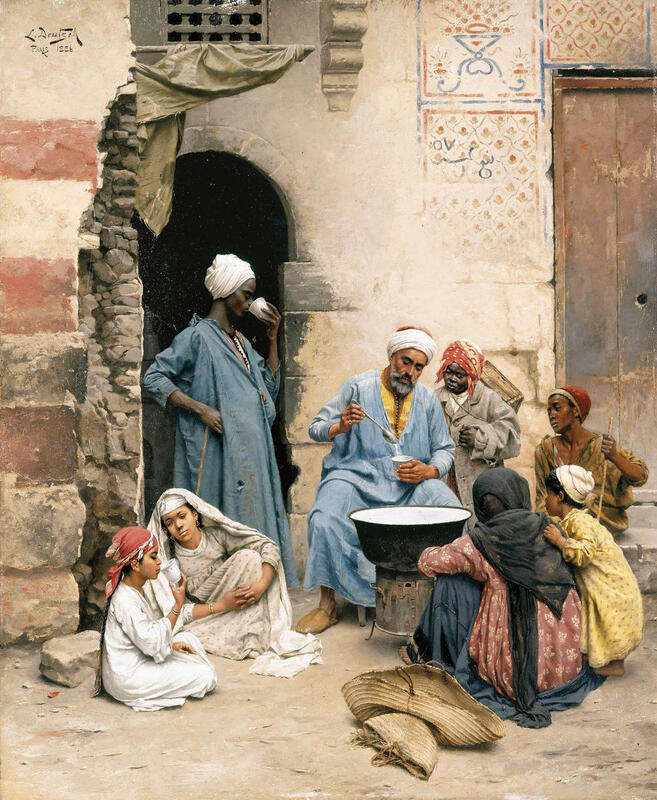 Ibrahim is a merchant in the main bazaar, he of course sells coffee and tea leaves; and for a time was the only man in the city I could find more exotic coffee beans from when the Baroness was out of reach. Is wife is a handsome woman from deep in the desert, a few scars on her arm tell she is from one of the tribes but had found peace in the city life. I never dishonor Ibrahim and make it a point to share time with him as I drink from the cup. As the rest of the neighborhood awakes, others move to join us around the pot of coffee. We chat in a mix of Yoku and common, I learn that Nagida’s daughter is going to move to Sentinel soon to marry a wealthy merchant and that Iztuti has been hired as one of the guards in the city. I am treated with suspicious glances at that and shrug my shoulders, I tell them that Tava’s winds are mysterious and they chuckle. I am their Huntmaster as much as I am that to the Marquess, if I can I manipulate the winds in their favor. An orphan from Tall Papa sneaks out to join us, Ibrahim chastises them gently but shows them how to prepare coffee quietly. All too soon I have finished my coffee and must bid them farewell, they ask that Leki guides my blade and Tava my path as I have often done for them in the past. My throat was not as dry anymore and my shoulders were a bit lighter. When I arrive at the gates of the estate, the guards let me in without a second thought. In the past, in the first weeks that I arrived, I would have to wait for a time with the men. I would come with Khubla, flat bread, covered in date jam to share with them as I awaited approval to enter. Now, after such a time in service Ra Kotu I am occasionally greeted with the same treat. The soldiers know me from my time with them in the war, we speak for a few minutes while we break bread with one another. I learn that Musa is becoming a Sergeant soon, finally through with his training to become a Gallant and could leave his duties as an archer on the walls behind. We all give thanks to Ruptga for that, Musa had lost the fingers of his draw hand during the Siege of the Sun Keep during the War of the Lions. The role of Gallant was a welcome promotion, he had spent months practicing his swordsmanship to prove himself worthy of the role. Between bites of the food, I am also told of some grumblings amongst the guards that they are anxious to face the Brotherhood; I cannot help but confide in them I feel the same but to have patience. Amirah rolls her eyes a bit and jokes that I sound like her mother, but everyone is willing to wait a bit more for the enemy to reveal themselves. They bid my blessing and I thank them for the meal, we part ways with smiles as I enter the estate. My burns no longer nipped at me as my belly was full of the bread and jam, the pleasant feeling driving the ghosts away. When I became the Huntmaster, even when the role was de facto, I had not imagined as much paperwork as their was. I was not only their leader, but often their organizer and managed the requests from villages and tribes across Ra Kotu. I delegated far more often than I expected and always found my day, regardless of what was to be done, filled with reports from the eyes and ears of the sand. Dispatch, request, bounty, and report occupied me for hours. Then I would walk the grounds of the estate, before exiting through the gates once more as I returned to my home to train and prepare for the next day. My journey there was of course extended as I walked through the narrow streets and exited through one of the city’s main gates. The sun still hung high above and although it was midday, I had an appointment amongst the tribes. Since the Lion’s War had ended, many of the nomadic tribes camped closer to Tuktura’mei than they once did. Sometimes right along the wall if there was no clear and present threat. To go from the cramped confines of a city to the open space of a nomad’s camp is a welcome thing. The Ne-Ghraewaj and The the Shen-She-Ru-Duptra set up near the city for sometime, the lovers Chieftain Salim and Iris Ne-Jinn invited me to their tent for a meal. Their love has been an odd affair, at one point I had led a warband to their camp to break an arranged marriage between them as Iris sought to take her walkabout in celibacy. Salim was and is an honorable man, accepting this and supporting her throughout it. She has many more months of isolation left, but visits the camp of her family for prayer as is permitted amongst her tribe. If Salim happens to be there and her family happens to be on a hunt, who is Ruptga to judge such a coincidence only he could arrange. A pot of Tajjin awaits me and the smell of the spiced chicken and cuscus is enough to make my stomach grumble as I join them. Iris’ young sister Kiya is there as a witness to Iris’ vow of celibacy during her walkabout and I am that to Salim. As far as I could tell, the tension between them was as thick as the steam coming from the Tajjin as it stayed warm over the fire as we ate. Using unleavened bread as our utensils, we ate until it was difficult to stand. More and more from the tribes joined us as time passed, eager to see Iris after her journeys before they departed again and to seek Salim’s council for any troubles that arose. In my eyes I saw a court forming in the shade of a simple tent and food, but one without the pomp and masquerade of the nobles I have come to meet in the service of the Marquess. I saw the simple honesty and honor of my kin, the thing that the sacrifice of those thousand souls helped preserve there around a growing feast and I could not feel the weight of their loss on my shoulders. I could only feel the warmth of their souls, even in the absence of their bodies.